This week is my last week of summer break. This is my last week of not having my day already planned out. This is my last week to prepare for the semester, and I’m going to make good use of it. I am in a completely different place right now than I was last year. Quite literally. Last year we were living in Columbus, I was studying to finally pass my comprehensive exam so I could graduate and fully start my PhD, taking only one class, and working as receptionist at a nursing home. Now, we’re living closer to campus, I’m going into my second year as a PhD student (which is still surreal! ), I’ll be taking 3 classes, and I have an assistantship at the Writing Center on campus while also tutoring. It’s going to be a completely new experience for me. Until now, my on campus job has been teaching three days a week. I’ve only had 50 minutes those days, plus two hours for office hours, devoted explicitly to work. The rest got done when I got it done. Now I have a very regular schedule that takes up a good chunk of my days, between class and work. I’m going to need to bring lunch with me three days a week. I’m going to have to grab dinner from somewhere twice a week. It’s going to be interesting. So, I decided to use this week to start to get used to that schedule. I’m going to start going to bed at the same time, getting up at the same time, “getting ready” to go for the day within the time I have in order to get to campus on time. While I’m not going up to campus, I am going to spend the time I would at work working on my presentation for CPAC at the end of the month. I will try to work on what I can for class (there’s only so much that I know for my classes right now), and keep working on my paper and other research if/when I run out. Basically, try to get my mind into certain habits so I don’t feel like taking a nap in the middle of class out of habit. This summer has been an experience. Where to start. Well, I took two classes over 12 weeks. Each class was 6-weeks long and covered a typical semester – 15-weeks. It was a lot of information in a short period of time. Also, the first class was online, which I haven’t done at the grad level. It was also a mixed class with grad and undergrad (seniors) students. Thankfully the information was the same from one of my master’s classes, just from a different perspective, so it wasn’t as overwhelming as it could have been. Looking at international communication and international popular culture don’t seem to be too different after all. The other class, Intro to Media and Comm, did meet in person once a week and I think was trying to kill me. The professor is great, and I’m looking forward to taking another class with him in the fall. There was so much to read and write every week, it was a struggle at times to get through it. But I did, and I’m glad I took the class. It’s given me a different perspective on a lot of what I learned during my master’s, but not the same information. It solidified my decision to go with a Media & Comm secondary focus and certificate. During those twelve weeks I was also a tutor for two different classes. The first session I tutored some football players for Psych 101. It’s been so long, but it was an online class, so all the lectures were online. It was helpful for me in having the professor’s exact definitions available, but it was a ton of information squished into 6 weeks. It was intense. I was not jealous of those guys. The second 6 weeks were Sociology 101 with a group of football players. This was a little harder to help them with because it was in-person, and I had to look stuff up at times. And, it was a lot of information thrown at them in 6 weeks. But it was fun and a great learning experience for me. But, with all of that going on, I didn’t have time for my own research. During the beginning of the summer I was trying to fit it in, but my class work suffered. I put my full focus on the second class, dropping my own stuff. Now I’m in the middle of my actual summer break, all three weeks of it, and I’m finally able to turn my attention to the paper/presentation I need to have done by the end of the month (you can read more about that here). I’m actually getting a lot done. It’s probably because I actually want to work on it and I’m in complete control of it. I’ve found that tends to help. But, the end of the month marks the beginning of the school year. I’ll be taking three classes, working a 20-hour a week assistantship, and working another 6 hours as a tutor. Somewhere in there I need to keep working on research for my dissertation. Thankfully, one class should allow my final paper to contribute to my dissertation in some way. I’m trying to figure out how to bring it into another. I’ve heard the third class involves taking an existing paper and reworking it so it can be published. That may end up being my paper from spring that I’m presenting in October that I’m already working on reworking. It would help with that, as well as being a piece toward my dissertation, despite a few other papers I would love to do that to for class. But, the dissertation comes first. So far I’ve taken 6 classes and written 1 paper related to my dissertation. I know it’s possible to use class papers to work on my dissertation, I just need the opportunities. Now, I’m focusing on getting ready for DragonCon and CPAC. I’ve decided not to pack any costumes this year, which I wrote about over here. That means less stuff to fit into the car and get into and out of the hotel. I’ll probably post something here soon about basics of packing for something as big as DragonCon, which can easily be adapted to any con. This year I’m able to spend more time thinking about those little things that I know I’ve been letting slip through the cracks in past years. It’ll be an interesting break during that first week of class. But I know it will charge me up for the school year! Life has been quite complicated lately. The first week of May was finals week. The end of my first year as a Ph. D. student. I didn’t write the best papers for my classes, but they were good enough to get me Bs. It took me almost another week to get caught up on my grading. But, my students didn’t seem to hold it against me too much. I got some of the best feedback I’ve ever gotten. Even their problems and critiques were useful, not just “it sucked”. I am so happy and grateful to have had this class. They really helped me to become a better instructor. The weekend after grades were due was Marcon. It was so nice to get to see my friends again, go to panels, and be on panels. I’m starting to realize that my attitude is keeping people from approaching me in costume. I don’t know how to change that. It’s who I am. But as much as I am an introvert, I do like getting compliments and recognized when in costume. I put a lot of work into the whole thing, from the clothing to the props to the make-up. But if it doesn’t seem like I want to be approached, no one will. I need to be more aware of it when I can. Lets face it, sometimes you have ten minutes to get all the way across the con – which is a very long distance at DragonCon. Sometimes you can’t be stopped. Anyway. After Marcon, summer semester began. Well, the first term of summer semester. We have two terms over summer, two six-week classes that contain all the information of a 15-week class. In order to get caught up with where I should be, I’m taking one class each term. My first class is online, and it’s a split undergrad/grad student class. That is the more interesting aspect of it, not being online. Grad students have different readings and different responsibilities. Thankfully, because of my two theory classes and International Popular Culture, it’s going over topics I’m already very familiar with. It’s from a slightly different angle, but similar enough that I’m not too stressed over it. At the beginning of the month, my dad moved to New Hampshire. It’s a very good move for him. He didn’t need to take any furniture with him, so I got to take some things off his hands. We now have a dining room table, the old microwave hutch (which is at least 20 years old, probably more) that is now our bar, one of the end-tables that my parents have had since before I was born, and an almost 20-year-old wood futon frame. The futon is in my room, patiently awaiting the spring mattress to arrive so I can finally properly use it to stretch out on and study on. But those weren’t the only things he couldn’t take with him. He couldn’t take Harry. We have had Harry almost his entire life. He’ll be 15 at the end of July. But between his age and the fact that he’s black, we knew that he wouldn’t last if my dad took him to the local humane society. He’d be high on the list to go if they needed more space. We’ve been taking care of him until Saturday. He hadn’t adapted well to being here, and we just can’t take care of him properly right now. So I drove him to Columbus to a no-kill shelter. They couldn’t take him. They had no space, but, more importantly, they couldn’t have taken him even if they did. He’s never been to the vet. Without vet records, they couldn’t take him. The lady there said that at his age, the best thing would be to have him put down. He’s perfectly healthy, as far as we can tell, for a cat his age. Why would I do that? So after a breakdown in the car, I decided to take him to Columbus Humane. But they require you to make an appointment to surrender a pet, and charge more than I can afford right now. So I changed plans. I found Marion Area Humane Society and headed there. I felt bad because it wasn’t cool out yesterday, and he had been in the carrier for over an hour at that point. But he seemed to be okay. We got to MAHS and I started to break down again. He had been part of the family for almost 15 years. They had space for him. As they processed his information and mine, I talked with one of the volunteers. She said that they get people looking for older cats sometimes. More importantly, she told me that they are a no-kill shelter! He is going to be taken care of for the rest of his life. I am completely fine with MAHS being his home for that time. They are going to take care of him. Last night I had to fight the urge to check on him behind the futon – where he had made his home. I miss him, but he’s going to be fine! Remember, always take your pets to the vet. You never know what will happen to you. They may have to go to a shelter, and vet records are required by some before they will take your pet in. Well, that went longer than I thought it would. I’ll just leave this here and get back to working on the paper and presentation I need to have ready for CPAC and my summer watchlist. Last Thursday night, we dropped off the keys to the first place we have been able to call home. The place we have been living in for almost 8 years. He slipped the envelope with the keys in the slot at the rental office, got back in my car filled with the last of our things, and we drove off for the last time. It was a bittersweet moment. I’m getting a little teary thinking about it. We left our first home. We headed to our new home. Since I finished my master’s degree, we decided that we cannot keep only seeing each other on the weekends. But he’s still working in Columbus and all of my business is in BG. So we found a new place in between. It’s bigger than the last place – 3 bedrooms instead of 2, and 1000 square feet instead of 700 – and it has vaulted ceilings in the living room, dining room, and kitchen. It is on the third floor, which is taking some getting used to. Although moving helped with that. But we don’t have to worry about upstairs neighbors, and heat does rise. It’s been nice so far. I’ve been here for over a month now as we slowly brought things up. It’s allowed me to not only be closer to school and get used to the drive, but it’s given me time to get my room/office set up and functioning so I can actually get work done at home. It felt like things had been for the past two years: on my own during the week, home on the weekends. It also allowed me to get things unpacked as I could, keeping things somewhat organized so we can find things later. It was really useful when we moved the furniture in. We put the couch, TV stand, and TV in the living room no problem. We were able to actually sit down in the living room! We had dinner while watching Leverage. Or at least I watched as much as I could while eating and then came in here to get work done. One of those things I had to adjust to, not being alone anymore. Honestly, that, not the stacks of boxes everywhere, is what has taken the most adjustment. Not being alone anymore. I’ve become used to being able to make what I want for dinner when I am hungry. I’ve become used to being alone and having no interruptions – aside from my phone. I’ve become used to being the only one here during the week. It doesn’t help that there’s so much to unpack, go through, decide what’s being kept and what’s getting tossed, and finding somewhere to put things. Unfortunately in the last frenzied week of moving, the living room became the dumping ground for everything that we didn’t already have a space for. Now I make dinner and we retreat to our desks, because they’re the only place where each of us can sit down and have a flat surface to put things on. During all of this I still have to teach class three days a week, take class three days a week, hold my office hours, drive 2.5 hours a day, and get reading done for class. Why did I think we could move while I was taking/teaching class? Why didn’t we just wait until Spring Break to get the move actually done, giving us 2 months to get everything packed and ready to go in a couple of trips in a truck? It would have allowed us to get everything properly packed and labeled. It would have allowed us to properly go through everything and only move what was being kept. It would have let me keep going to class last week. If I can just get through the rest of this week and next week, I’ve got all of Spring Break. All of Spring Break to get caught up on my reading. All of Spring Break to get my students’ assignment graded. All of Spring Break to start going through the boxes of stuff. All of Spring Break to get things put away or thrown out. All of Spring Break to recover. But I have to get there first. One of the joys of being an academic is the academic conference. It’s a great place to present papers and get feedback from a wide variety of people that you would probably not see otherwise. The problem is figuring out what you want to present by the time the submissions are due. Since 2015, I have been attending the Comics and Popular Arts Conference (CPAC) that is held at DragonCon every year. Since 2016, I have also been a presenter at the conference. CPAC is a great conference to present at because it is open to all at DragonCon to attend. So not only am I presenting to academics and scholars, but to fans and individuals who may not have thought they could be scholars as well. It’s great for getting feedback, especially in regards to accessibility of your work to the general public. Just last week I had submitted papers to three conferences that are happening in the Spring. But, I forgot that CPAC’s deadline is next Friday. I was going “What am I going to present? I don’t have any idea what I’m going to write for classes next semester. I’ve submitted my paper for this class to a Spring conference. I don’t want to represent a paper, even if it is a different conference.” I was panicking. Then I remembered, I have a whole list of paper ideas I’ve come up with while working on the paper for class. When you have 8-10 pages, you need to focus. I am so glad I did that. It’s a good habit to have as an academic and as a student. You’re never going to be able to fit everything into one paper. Keep track of the things you want to talk about, makes notes on them, make note of authors you’d use for that paper. You never know when it will come in handy! This has been an intense semester. I thought it would have gotten better by now. Nope. It’s worse. The semester started out with the stress of not knowing if I would be continuing in the program and the stress of passing the comprehensive exam so I can graduate with my master’s degree. The exam was at the end of September, so that’s when the stress switched from preparing for it to whether I answered the questions to the graders’ satisfaction. Last month I found out that I had finally passed! I was so stress free for a week or so. I finally passed! I’m finally graduating! I’m going to be a full-time PhD student in the Spring! But then the stress began to creep in again. I need to find a job for the Spring that will work with my class schedule and not cost me much more in gas every day. We need to find somewhere to live that’s closer to campus but not far from here so he can keep working. We need to agree on where we’re moving to and when. We need to get things packed. Then, of course, class. That’s been the underlying stress of the semester. It’s not like it’s an overly hard class. It’s a theory class for all ACS graduate students, masters and PhD students alike. But I can barely find/make the time to study like I should. I started to wonder why, then I remember last school year. Last year, I had a studio apartment to myself in BG that had only what I really needed. I used the dining table they provided as my desk. I brought my TV, Roku, and some DVDs and player. I had my former desk, now coffee table. I brought my Sumo beanbag chair so I’d have somewhere to sit other than my mattress and “desk chair”. I was teaching three days a week. Teaching a class I had already taught alone and had a good idea of what I was doing. I had office hours once a week. I was able to keep my schedule flexible enough that I could get my studying done for all my classes with no problem. Then I’d go home on the weekends. Both hubby and I would be off of our respective work and could spend time together. Now, I’m home with all my stuff, all our stuff, all his stuff. I’m home with cable and all the channels that come with it. I’m home where my room is so full of my stuff, I don’t have a lot of space to have different places to sit, away from the computer, when I need it. I’m home sharing the space with my hubby 24/7. I’m home with a part-time job that lets me study while I’m there and there’s nothing else I need to be doing. But that’s the trick, there needs to be nothing else. There needs to be no residents who need my attention for whatever reason. And, of course, that drains me on a different level, so when I get home, I veg out in front of the TV and get nothing done. Then I have to time getting dinner ready so it’s done but not cold so we can eat together before he heads off to work. I only have one real day off every week – Tuesday – because I have class on Thursdays – involving 4 total hours in the car – and I have Church on Sundays. Tuesdays are the only day in the week that I can sleep in and don’t have to worry about it affecting anything. And of course, if there’s a movie we both want to see, somehow Tuesday mornings are the only time that works for him. Like yesterday. We went to see Thor: Ragnarok, finally, at 9:30am. I remembered at 2:30am that we were going to see the movie and checked with him when we were going. Of course 9:30am was the only time that worked for him. Which means I got up at 8:30, 6 hours after heading to bed, got dressed, and got another half-hour of sleep. I made stopping by Starbucks part of the plan so I could get a London Fog Latte so I would have a chance of making through the movie. I knew I would be that tired and I was. Thankfully it did its job. On the way out to the car I could feel it wearing off – which is why I bring tea with me to class on Thursdays. I crashed when we got home and spent a good chunk of the afternoon trying to wake up, eventually giving up and taking a nap, again. It’s not that I don’t love my hubby – I do, so very much – or that I didn’t want to see Thor without him – I didn’t. I just wanted to get some sleep and be able to spend proper time getting my reading done for class. It’s just hard adjusting to this new dynamic. For both of us. Being married and in grad school is not easy. I’m just finding this out now. I hope that we can get things figured out over break and I can start this next part on solid footing. I’m tired of scrambling to get both feet steady. Yesterday, I decided to start outlining for my final paper while at work. I had my 2-in-1 laptop, my sole laptop in the past year, to work on. It’s a great little machine. It’s 11″, small, lightweight, and also works as a nice tablet – especially now that it has a matte screen protector. But I’ve always had a bit of an issue when it comes to the keyboard. I think it’s that I’m used to more traditional keyboards. The keyboard I have on my desktop is a mechanical keyboard. I had read that it’s better for your hands and wrists because you don’t have to push as hard on the keys for it to register. I guess I’ve been using it long enough that it’s affecting my typing. The keyboard on my 2-in-1 requires a little more pressure. But I don’t use the keyboard for much outside of logging in to websites, so it normally doesn’t pose a problem. Yesterday, it got annoying. I was finding there were letters missing left and right, and in places where Word wasn’t catching them. I kept working because it was something to do while at work and I just couldn’t get into the book I need to have read for class this week. I decided to go ahead with a thought I’d been having for a bit. I still have my old laptop. It’s a 15″ and much heavier. But it has a full keyboard and keys that are more responsive to my typical typing. The 11″ 2-in-1 sitting on top of the 15″ laptop. Big difference! I replaced it with the 2-in-one partially because of the weight, partially because of the problems with the hinge on the right side being broken. But mostly because I had gotten my desktop and didn’t need as much computer on-the-go anymore. The laptop had been my sole computer for a couple of years. But because of that size and power, I had been thinking of pulling it out and making it my portable writing desk. It also has a program or two still installed that make writing projects easier. Last night, after getting home from work, I pulled out the laptop, plugged it in, and got working. Definitely the right move. I don’t worry about missing letters because I can feel the keys depressing and registering on the screen. But it’s been an adjustment going from an 11″ to a 15″. Everything on the screen is so much bigger (yay!!!). The keyboard is more responsive – as well as having the number keypad to the right (yay!!!). I still love my 2-in-1. It’s going to be my everyday laptop. But, for larger writing projects away from the desktop, my 15″ laptop is going to be my go-to. Now I just need to do some research so I can get the parts to fix the hinge and be able to keep it working overall. New skills! More wisdom from The Dude. Imagine that you’re rowing down a stream and you’re trying to figure out how to do it. Do I row with the right oar and then with the left, or is it the other way around? What does my shoulder do, what does my arm do? It’s like Joe, the centipede with a hundred legs, trying to figure out which leg to more first. …He can’t get anywhere, just like the person in the rowboat. And while he’s hung up with all those questions, the stream is pulling him on and on. So you want to row, row, row your boat – gently. Don’t make a whole to-do it. Don’t get down on yourself because you’re not an expert rower; don’t start reading too many books in order to do it right. 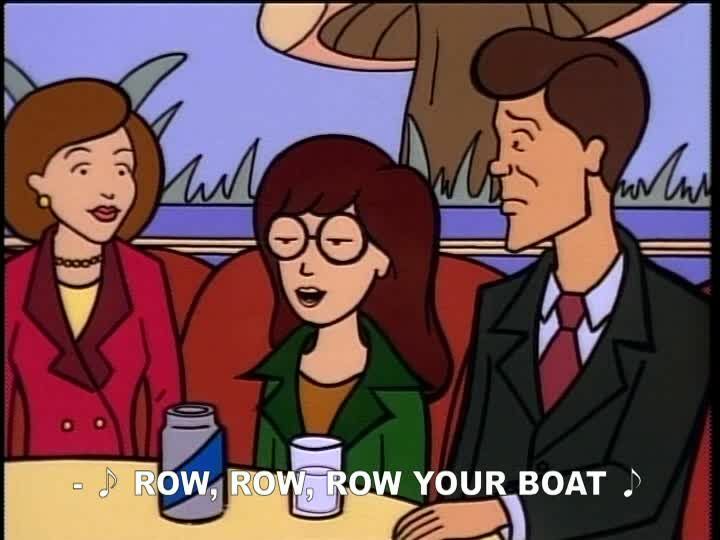 Just row, row, row your boat gently down the stream. I was worried that I was doing that and I had screwed things up again. Because when I get stressed or anxious, especially when I have to take an essay-based exam, my mind goes into overdrive and I go off in directions that don’t matter. I’m flailing trying to move my boat forward when all I’m doing is staying in place. In the book, they continue talking about boats and streams and other bodies of water. We’re always rowing to reach a shore. But there is never going to be the shore. But if you are going somewhere else, let me say this much: At least change the boat and the oars. Say I get to the other side, what do I do? Well, I got here thanks to this beautiful boat with the set of oars, so I’ll just hold on to them and carry them wherever I go. Isn’t that weird? Now I’ve got the burden of carrying around whatever got me here. Instead I get rid of it, and I’m free. Time passes and now I want to get to the next shore. I’ll probably need a new kind of boat and different oars, because maybe now the other shore is on the other side of the ocean and that requires a whole other mode of transportation. I was trying to get out of the one boat to the shore so I could get into the next boat. Instead I had one foot in two boats and was trying to keep both by the same shore.